Dave....sometimes I can pull pics from my FB account to use here and other times I just can't (for some unknown reason). I'll accept you as a friend so you can view through my images. I was going through my reference books and found that I had an extra copy of: "Masting and Rigging the Clipper Ship & Ocean Carrier". It is in very good condition. If anyone here is interested in it drop me a line. That's looking great! 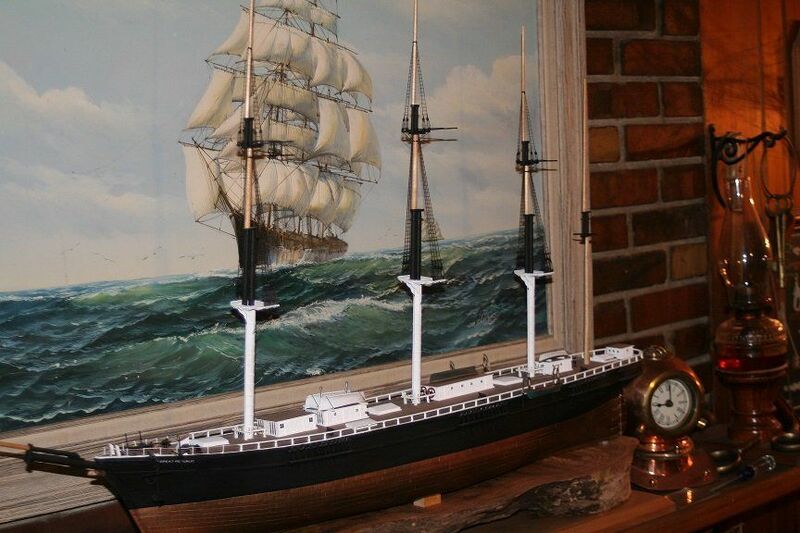 She's a beautiful ship in the flesh (wood), and has one of my favourite figureheads. Would like to do this build myself one day. Lol, guess they fixed the reply notifications...just got about 40 emails from various threads on the ship forum! I don't even want to look at my email until tomorrow morning. Anyway, your CS is looking awesome bud. I’m loving it! Dave, You may know of this, but Amazon is listing a new book on the Cutty Sark. Jake, I'll keep an eye out for that book....though I have to say with the Campbell plans and Longridge's book, there's a lot of good info! 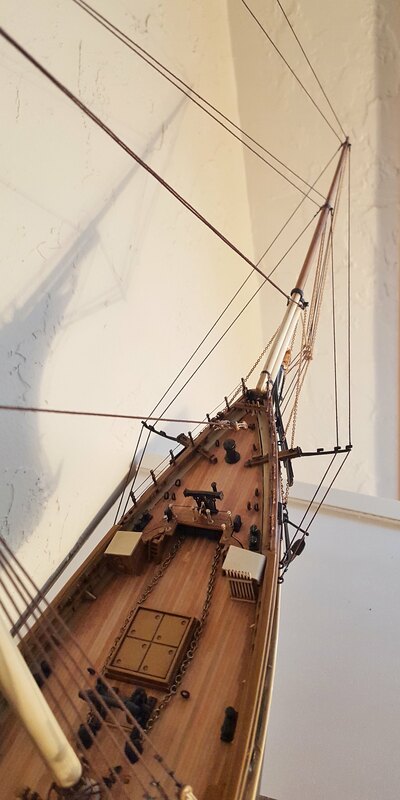 This is the installation of blocks on the foremast before stepping....I was actually suprised at the small number of blocks for the masttops...most of the rigging blocks go on the yards or the stays. Starboard view...got all the shrouds looped, and I'm working my way up on the foremast...adding temp forestays to keep the mast upright while tensioning the shrouds, then installing the actual stays before repeating for the topstays, tgall, etc....it's a tricky business, keeping the tension even whilel working upward. By the way, the lower deadeyes, while they are riding pretty high, are working well and they are pretty even...I was a bit concerned! Anyway, it's going pretty smoothly, once I finish the fore standing rigging, I'll rig up the headgear and bowsprit stuff. 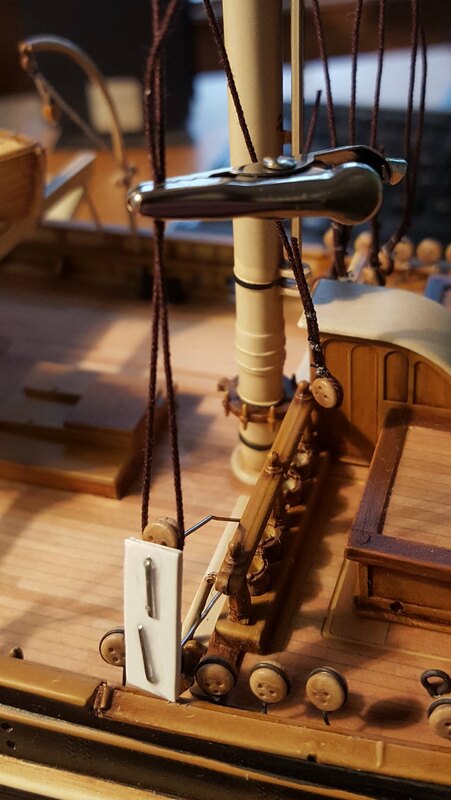 Then I have some more deckwork to attend to (headboards, boat tiedowns, davit rigging)....I'll do that stuff before the main shrouds go in, I think. as usual , beautiful work david . really enjoying tjis build . Great attention to detail and a handsome outcome so far. 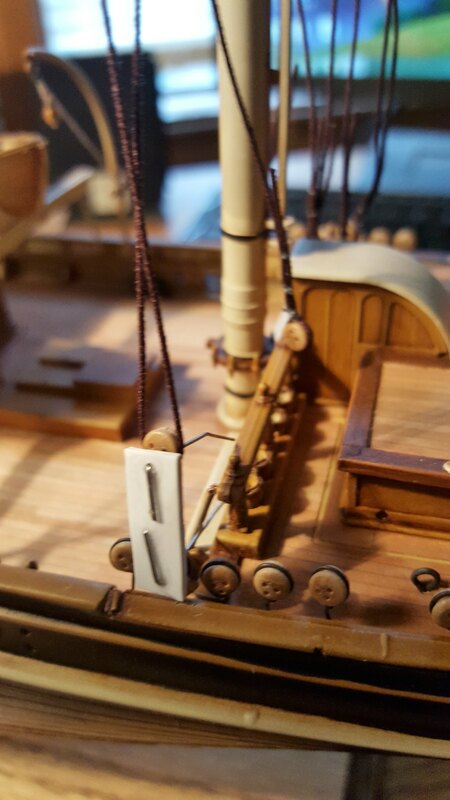 Dave, don't forget to put some iron/steel flanges toward the bow corners of the hatch where the anchor chain rubs ... .
Coming along nicely Dave...it apears your blocks have gone adrift on your stepped foremast...from the previous image of the mast in the vise. Dave I fashioned hooks for all my blocks that mounted to the masts..saving eons of time...I used the supplied blocks..and after they received paind and the hooks looked pretty convincing. I know that I’m sounding like a broken record, but you are doing beautiful work on her! Love the posts. LOL Steve, thanks....I feel the same way sometimes....I look at people's progress pics on here, and it seems like all I ever say is "wow, looking good! "....but it's true, I see so many updates that amaze and impress me. Rob, the mast shown in the vise was the mainmast...it had more blocks. For whatever reason, even though the mastcap had those eyes to accommodate some blocks, they aren't called for in my plans? In fact, I think the mastcap parts are identical for the fore and main mast, same with the tops....wonder if they molded them the same to save time ro money in tooling? I remember seeing your hooks when I was at your place....made for a really nice touch, and I bet they did save some time! Great work! 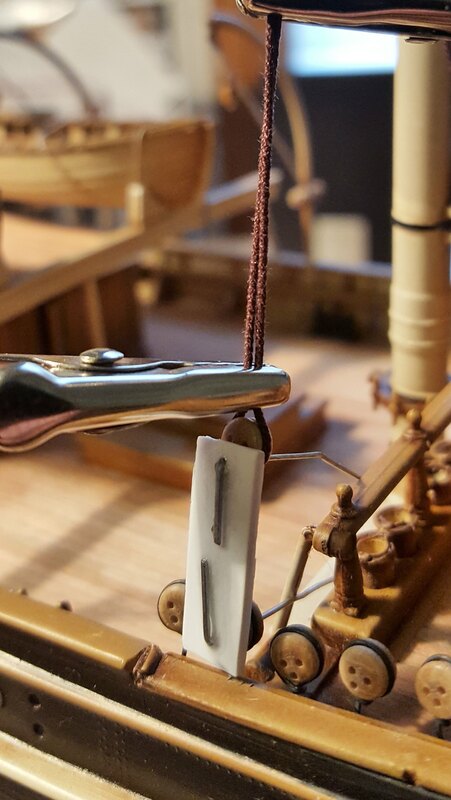 I recently came across all the individual plans for many of the CS's I've built over the years and it is clear there are some changes made fron the earliest to the newest plans, especially with the rigging...it has been made simpler it appears. How's things coming along David....Haven't heard from you in a while. Before I install the fore backstays, I'm going to finish fastening the anchors and other deck work (boat davits, tie-downs, etc. )...feel like I should get as much of that remaining stuff done before I block myself out with the rigging. All in all, it's going pretty smoothly these days...slow, but smooth! Looking very nice there Dave, those photo etched parts really stand out, great work !!. I hope to start mine next year. Absolutely lovely, crisp, detailed work! Is that dolphin striker the kit part? Mine was so bent I could never get it to be straight. Yours looks perfect! 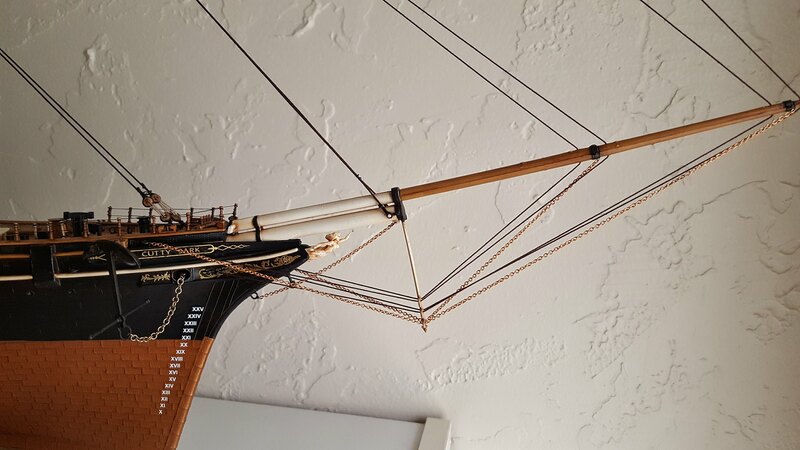 Where'd you get the chain you used for the bow sprit rigging? Should it not have been blackened? I'm probably off base here but just curious. Yeah, the photo etch turned out okay...glad I used it instead of decals or painting for the scrollwork. Had some time this week to get the rest of the lower shrouds installed. 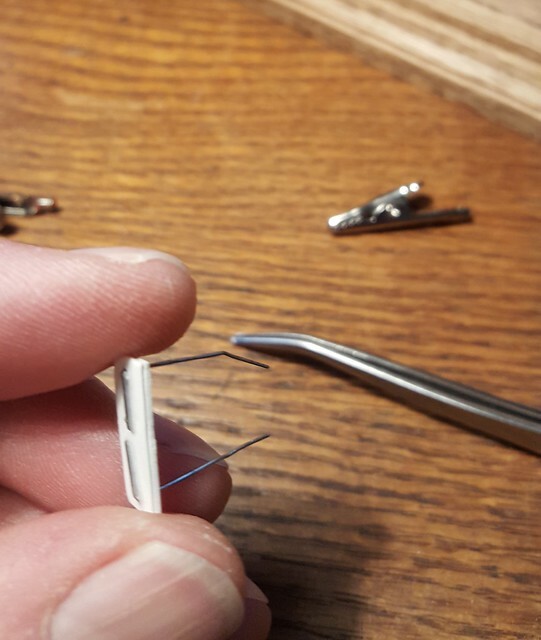 Figured I would share some pictures....not because my results are out-of-this-world or anything, but mostly because I don't know what method others use for spacing their deadeyes when they install shrouds....maybe the jig I use is typical for everyone? Add a couple seizings for the shroud, and voila. Then I pull the jig off and go on to the next shroud/deadeye. I used to tie each pair of shrouds and finish the lanyards as I went, but I found that as I worked aft, no matter how careful I was to keep the tension even, the foremost shrouds would end up slacking off slightly. 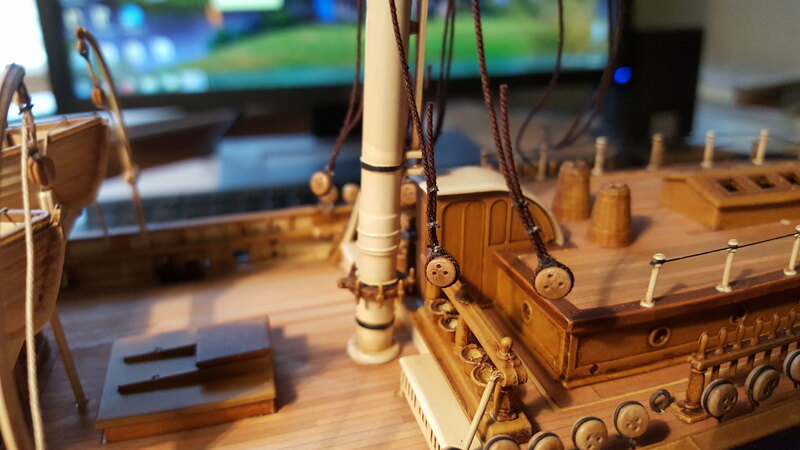 Now I run all the lanyards without tying them, and then I work from aft to fore as I add tension and hold them temporarily with alligator clips until I have the correct tension along the set (and it helps me keep the mast lined up). 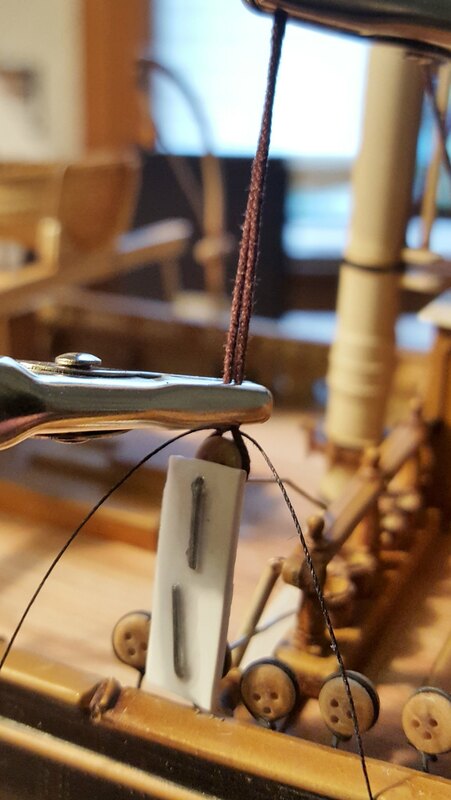 It's also worth noting that I put the stays on after the shrouds, so I always tie on temporary stays to keep the masts from being pulled back while I tension the shrouds. 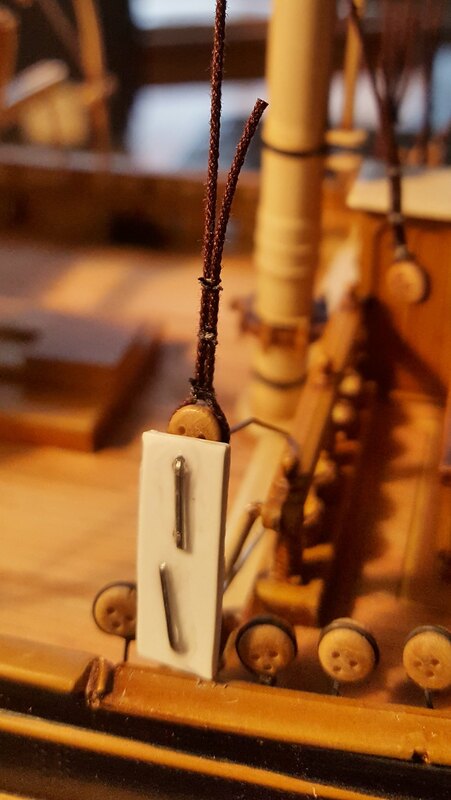 Anyhow...the topmast and tgall shrouds will be quick and easy (only a few on each side), so I should have those done soon, then I can get all the Main and Mizzen stays on....there are a LOT of backstays on this model, each with deadeyes at the deck, so I'll be working on that for a while yet...but I'm a good deal into the standing rigging now...figure I'll be ready to start thinking about sails before too long....might go with a silkspan material, but I really like what Rob W does with paper...might need to bug him for some pointers. very nice dave , now you show me LOL , will have to remember this , if I ever do another ship . What Steve just said .. +1. That's a better system than I've been able to come up with. Thanks for taking the time to make a visual toot. I suppose in theory the spacing between the deadeyes gets longer as the angle of the shroud increases, but for all practical purposes that's not really an issue here. That's the kind of stuff I get myself hung up on. Dave, I am really interested in your rigging process. It seems that you are rigging the shrouds before the standing and running rigging? I am asking because in a year I hope to be able to rig a 1:96 USS Condition (never been there)! Rob, I use CA to set the knots on my shrouds (and a lot of other rigging lines)...it dries fast, and strong. The only problem really for me is that it sometimes discolors the line (especially light colored line for running rigging) where I apply it, so I do so sparingly. 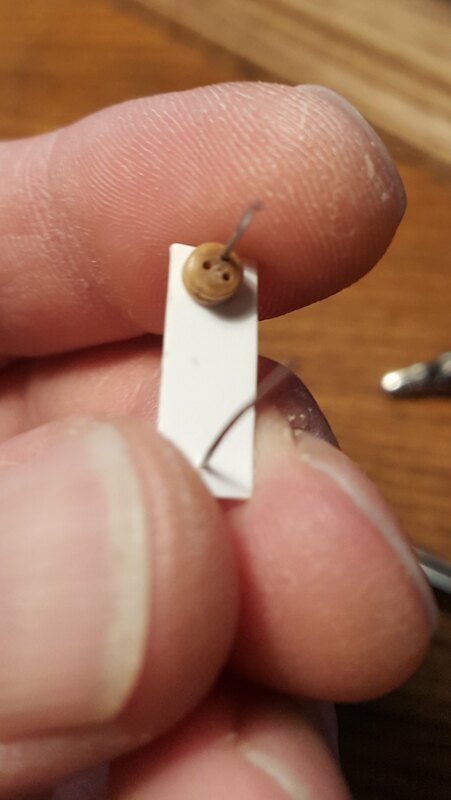 I keep a toothpick and some little squares of shiny cardboard (like cereal box material)...when I need to apply some CA, I put a few drops on the cardboard and apply it with a toothpick. GM, I have the fortunate position of not begin too hung up on the little stuff lol...I love the work I've seen of yours, your attention to details is incredible! 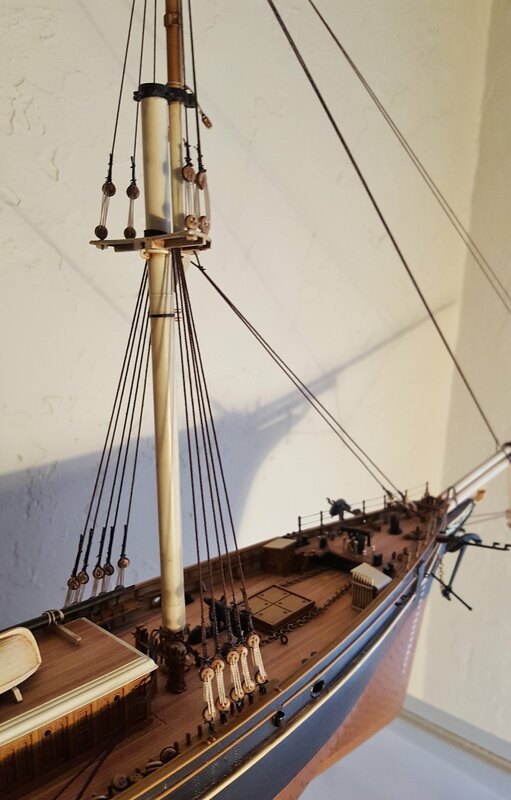 Shipwreck, I install the shrouds (as part of the standing rigging) first, because they are the first lines piled onto the foot of the mast. I install them, and then move on to the stays, since they are piled above the shrouds...this way, I can keep the loops stacked up correctly and keep everything tight as I work my way up...I don't know if my method is different from other people? I wanted to say I think your build is coming along extremely nicely Dave and wanted to encourage you as you work out the rigging. 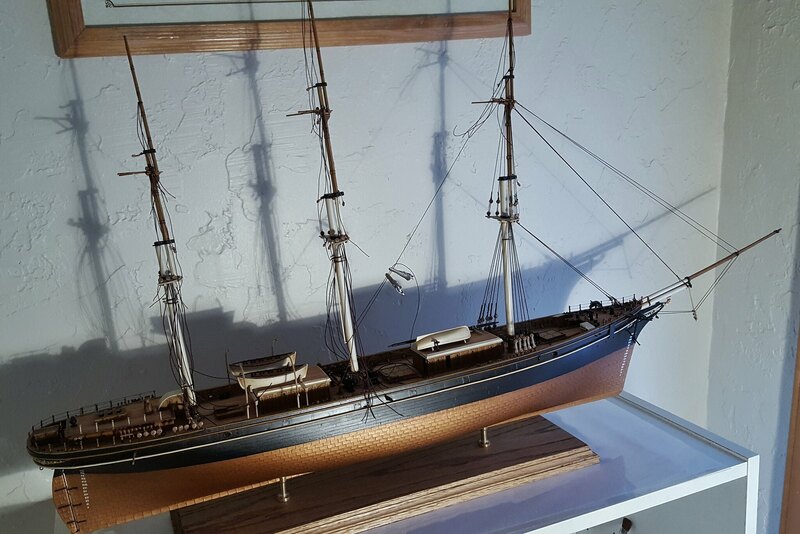 I know you focus on detailing the model with a superior paint technique and such...but I also encourage you to detail her in her rigging as well....do your do-dilligence when it comes to studying of her rigging...it will make the model that more impressive...and will cause your own knowledge of clipper ship rigging to grow. 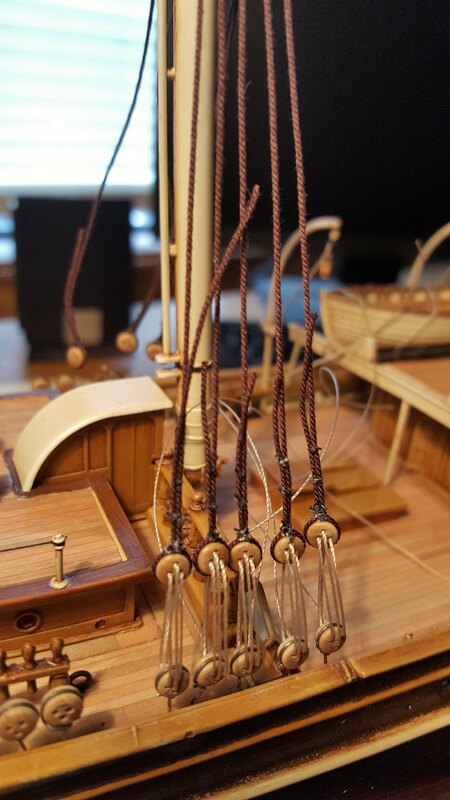 I have been working on my scratch build 1/128 Great Republic and I finished up all the top shrouds for her masts. 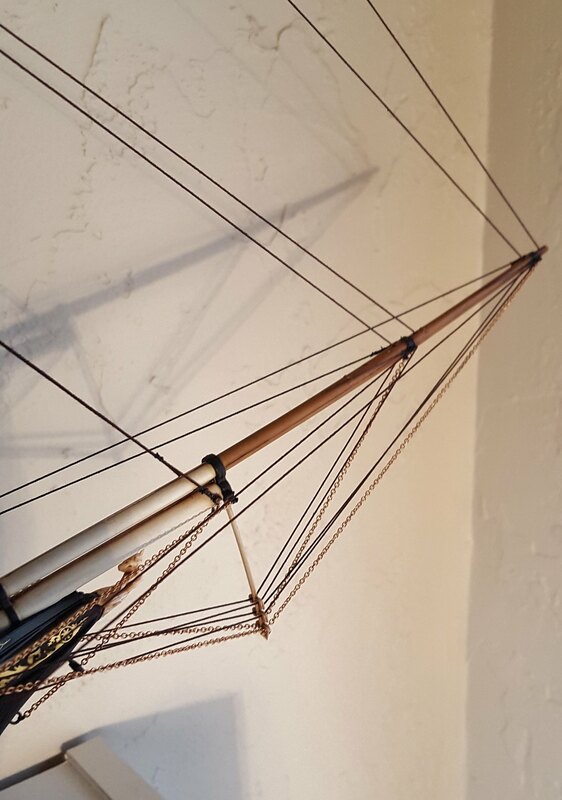 I'm focusing on working up the paper sails currently and how to work out all the rigging accociated with them. Here is an image of her currently.